Come to think of it, isn’t this exactly the kind of situation that his iron torc and belt were supposed to prevent? I guess there are ways for a cute girl to get a teenage boy to take his clothes off without any magical enchantments involved, but someone really should have told him to always remember protection when he’s with a girl he doesn’t know. Actually yes, what’s EXACTLY what they’re for. What happened is that I was running out of space for a page where they tricked him into removing his iron so that the fairy magic would work. I was planning to have it explained latter but now I’m contemplating whether it wouldn’t be best to change Fand’s dialogue is this page intead so that the audience doesn’t get confused. Well, I think anyone wondering why his amulets didn’t protect him will noticed they’re missing in this page and assume they tricked him into taking them off or removed them by force. 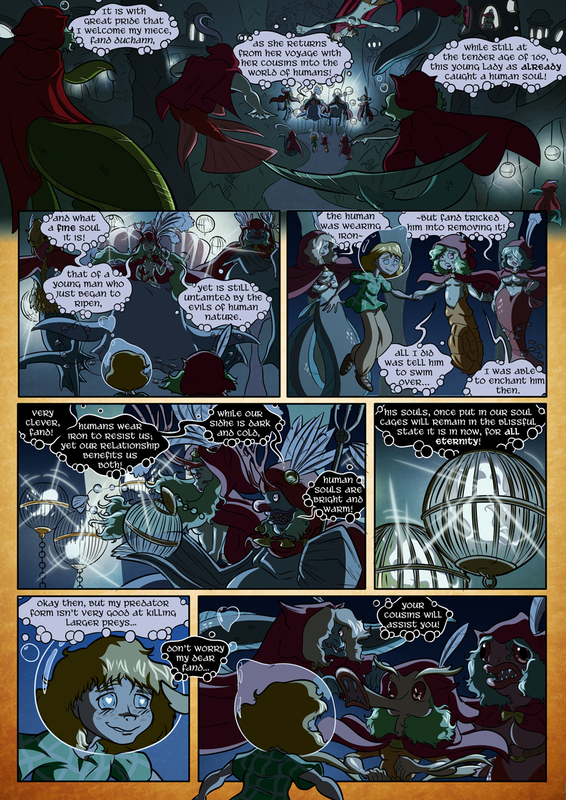 One thing that did confuse me on this page was the monster girls in the final panel and the three merrows in the third panel being the same characters. I thought the three monsters were three of Fand’s other cousins that weren’t as good at magic until I noticed the hair colors were the same*. You haven’t really introduced the idea that a merrow might have more than one alternate form. Maybe you could change Fand’s dialogue in the sixth panel to mention that she’s talking about her “monster shape” or “war form” or whathaveyou. I assumed she was talking about her qt crustacean maid transformation. Hey, thanks a lot for taking your time with the suggestion. I *THOUGHT* it would have been obvious enough since the “monsters” looked similar enough to Fand and her’s cousins’ mermaid forms, but you’re right that making a distinction between her seahorse-maid transformation and her seahorse-monster transformation would make the scene easier to read.